Description: Santa Fe GP60 brings up two recently sold BN SD40-2's to CEFX. As of 2014. Both units are still riding the rails. 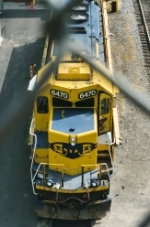 Description: Looking down on a classic Santa Fe EMD SD45-2. One used to be able to see MANY 45-2s around Northtown Yard, now thats history. Date Approx. Description: Southbound BNSF freight train - BNSF Gainesville Yard. Description: Light engines that moved out of Saginaw Yard, so they could reposition north of the Interlocker, then change to the main of the BNSF Fort Worth Sub and head back into the yard. Description: Six SD45-2's sit lined up at the shops, with two SD45-2's off to the side. Description: Eight SD45-2s are in this shot. Six in the line, and one on each of fueling ramps. Later in the day the lineup was:BNSF 6480,6470,6460,6457,6455,6469,6505 and 6466. Description: Anybody with ID's on all of these would be greatly appreciated! Description: Monticello Local at left prepares to depart.